Smart card reader: cac dod card. Type: SIM Card. Interface: USB. Describle: sd card usb adaptor. Card Slots: Single. Forces through the USB port, without the need for extra power. 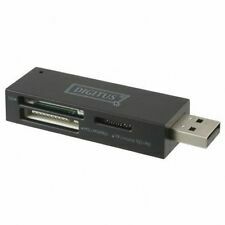 USB 3.0 interface. Fast transfer rate for copy / download / backup. We might require you to send us photo/s of the item received and also your original item so we can compare and conduct necessary actions. The LUPO USB 2.0 Single Slot SDXC Card Reader is a fast and convenient way of transferring data between any SD Card and your PC or Mac. 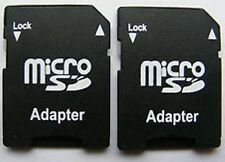 Backwards compatible with SD Card, SDHC, miniSDHC*, microSDHC*, miniSD*, microSD* and also compatible with microSDXC, MMCmobile, MMC, MMCplus, RSMMC and DV-RSMMC. 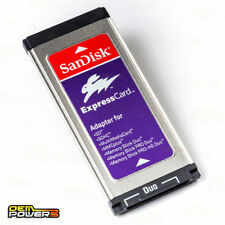 Support for SD / T - Flash CardTransfer rate: USB2.0, 480Mb / sOperation Voltage: 2.7V - 3.6V DC USB portDimensions: approx. 55 x 16 x 10 mm / 2.2 x 0.6 x 0.4 inchesUSB interface: Micro USB / USB Card reader: SD / Micro SD card Easy installation Plug and Play device, no need external power Read and write flash LED light Support for charging while connected to the charger PC operating systems: Windows 2000,2003, XP, Vista, 7, Mac and Linux 2.4 or above 10.45. Support for Samsung Galaxy SII i9100, SII i9220, 9300 SIII, Note II, Ericsson, HTC new one, HTC Butterfly, Support smartphone and tablet with OTG function, micro USB port Material: ABS Color: white Package Includes: 1 x USB OTG SD Card Reader Note:Light shooting and different displays may cause . Fully Loaded 8GB SD Card - Easy Plug & Play - US SHIP! 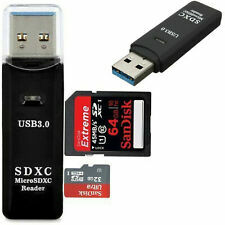 (1) Sandisk MicroSD USB Reader. The item pictured is the item you will receive. Note: The MicroSD card is not included. It's for illustration purposes only, you will only receive the Sandisk MicroSD Reader. 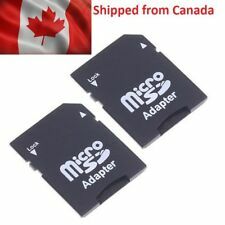 1x Micro SDHC / TF Card To SD Card WiFi Adapter. WiFi@SD settings: WiFi password, AP Mode and Station Mode switch, IP, channels, number or users, SSID. WIFI@SD Default Password: 99999999. SD browse file formats supported. This unit is compatible with Windows XP/7/8 and MacOS. SCR3310v2 Smart Card Reader. Reads DoD CAC Cards and other Smart Cards. Generic (TM) PCMCIA USB 2.0 ATA Card Reader Support Flashdisk, Pcmcia, PC Card ATA,ATA Flash. Support TYPE, TYPE I 3 mm thick PC ATA protocol flash CARDS ,TYPE II 5 mm thick PC ATA protocol flash CARDS. Support Panasonic P2 card. Supports Windows XP, Vista / Windows 7/8/10. (NOT for Mac). Supports Windows XP, Vista / Windows 7/8/10. Compliant with PC Card Standard Release 8.1 Specification. Compliant with PC Card Standard Release 8.1 16-bit Specification. Output: 12V/5V, standard power cable (SATA 15 pin power connector), provide power with SATA hard disk. 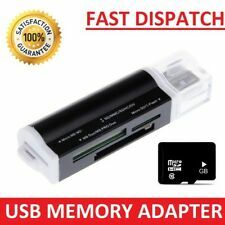 Supports SATA with transfer rate up to 3.0Gb/s, uses the power cord and data connection for SATA hard disk and devices. It is compatible with SDHC, SDXC, microSDHC, and microSDXC cards, including those carrying the Ultra High Speed Class 1 (UHS-I) designation. Compatible with SDHC, SDXC, microSDHC, and microSDXC cards, including those carrying the Ultra High Speed Class 1 (UHS-I) designation. 1 (ONE) GE USB 2.0 6FT EXTENSION CABLE CORD A MALE TO A FEMALE. 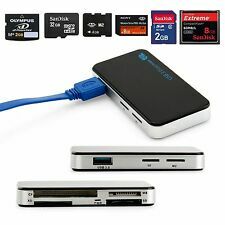 1 (ONE) GE USB 2.0 HI-SPEED SD CARD READER/WRITER. Includes 6 ft USB 2.0 extension cord. Conserves digital device batteries by using USB power from your computer. 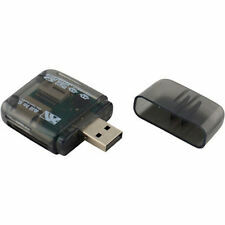 BLACK NEWLink USB 2.0 card reader and writer with Front USB Port. View, copy and edit the image/photos/data/music directly from the reader. Supplied with 5.25” Bay Adaptor, so will fit into a CD/DVD bay or a 3.5 Floppy Bay. Supports SDXC / SDHC / SD / WIFI SD all capacities. 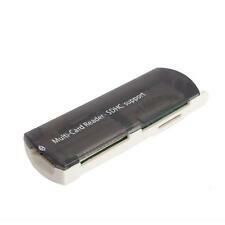 This adapter converts your SD Card to a type I CompactFlash card. ONLY ADAPTER WHICH CAN ACCEPTS MOST WIFI SD CARDS ASWELL. THIS IS FOR CF TYPE 1 DEVICES, NOT FOR TYPE 2. This is a portable compact PC desktop floppy-bit multi-function front panel, that lets you add an Internal Card Reader to the front panel of your desktop. Standard 3.5" floppy drive size, designed to fit standard 3.5" front panel bay. New in box! Picture is sample of one we opened. 25 available. Priced to sell with free shipping. This adapter supports converting SD, SDHC, SDXC, SDIO, iSDIO, miniSD (with adapter), microSD (with adapter), microSDHC/SDXC (with adapter), MMC, RS-MMC (with adapter), MMC Plus, and. Input Socket SD / SDHC /SDXC (SD Specification 1.01, 2.0, 3.0, and USH-1). NAND Flash: MLC. Mfr Part Number: FDM512JMDF. Computer monitors containing cathode ray tubes. Request an RMA Number. Product pictures may not reflect the most recent product revision. This includes California residents. OMNIKEY 3121 USB - TAA compliant, USB 2.0, EMV, CCID, TAA compliant, Qty 500-990. Series: HID GLOBAL. USB connection. Item model number: R31210049-1. Color: Black & Gray. Internal Solid State Drive (SSD). Form Factor. 4KB Random Write. 4KB Random Read. Max Sequential Write. Max Sequential Read. Akasa BayMaster S. Optional USB 3.0 PCIe card with one internal USB 3.0 port (AK-PCCU3-02 ) allows internal USB 3.0 connection. Hot Swappable for quick HDD docking. Data transfer rate HDD docking: up to 5Gb/s (USB 3.0) and 480Mb/s (USB 2.0).